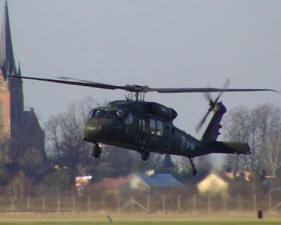 November 16, 2010 - An S-70i Black Hawk helicopter has flown in Poland for the first time, marking an historic milestone for the helicopter line being produced by Sikorsky Aircraft’s company in Poland, PZL Mielec. Sikorsky Aircraft is a subsidiary of United Technologies Corp.
PZL Mielec is the final assembly center for the S-70i helicopter, the newest Black Hawk variant, which is being produced for the international market. The aircraft that took flight in Poland on Monday is the second helicopter to be produced at PZL Mielec. “The S-70i Black Hawk helicopter program has been executed seamlessly and Sikorsky Aircraft celebrates this landmark moment,” said Robert Mastronardi, S-70i Senior Program Manager, Sikorsky Military Systems. While the second aircraft in the new line begins to accumulate production flight test hours, the first-ever S-70i Black Hawk helicopter recently completed flight testing in the United States and is being fitted out with options. The options that will be developed for the S-70i will enable customers to perform missions such as humanitarian relief, search and rescue, medical evacuation, command and control, and armed patrol. In addition, the next two aircraft in the S-70i Black Hawk helicopter program are in final assembly at PZL Mielec, with a fifth aircraft slated to begin production in December. Deliveries to the launch customer of the S-70i helicopter program are expected to begin in 2011. In preparation for flight testing capabilities to be done at PZL Mielec, the company refurbished an existing hangar and paint shop to create a world-class facility that will be the production test flight hub for the S-70i Black Hawk helicopter program. The S-70i Black Hawk helicopter incorporates the latest technology with advanced features such as a fully integrated digital cockpit with a dual digital automatic flight control system and coupled flight director. It also features an active vibration control system that will smooth the overall ride of the aircraft. The dual GPS/INS system with digital map provides accurate and redundant navigation for the most demanding of tactical environments. The end-user will benefit from the aircraft’s modern, robust aircraft configuration and ability to leverage existing interoperability with Sikorsky’s worldwide fleet of Black Hawk helicopters. Sikorsky Aircraft Corp., based in Stratford, Conn., USA, is a world leader in helicopter design, manufacture and service. United Technologies Corp., based in Hartford, Conn., USA, provides a broad range of high technology products and support services to the aerospace and building systems industries.